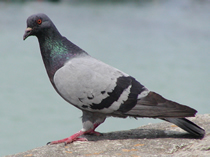 This is the number 1 urban pest bird throughout the world. 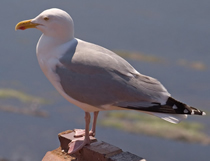 Much loved by the general public, they are responsible for most of the bird fouling of buildings in towns and the transmission of bird diseases to humans such as ornithosis. Many systems are available, but great care must be taken with product choice for each part of the building. Netting with 50mm meshnet is the most successful method. Other options are available if a net is not appropriate. These large, aggressive birds are causing an increasingly significant problem due to their recent use of buildings as sites for breeding colonies. The noise, mess and smell can cause serious distress. A number of heavy duty systems are available, with netting using 100mm mesh being most successful. Other options are available if a net is not appropriate. This is a major problem for the food industry, with populations becoming established in warehouses and retail premises. These "flying mice" gain entry through very small holes and then damage and foul stored food and are extremely difficult to deal with. Few systems are effective, due to the birds small size and agility, with the exception of 19mm mesh netting. Other options are available if a net is not appropriate. This can be a major problem in certain localities and of no significance in others. The problem occurs when large numbers (can be tens of thousands) gather for night roosting. The noise, smell and extensive fouling caused can be horrendous. Fungi associated with dried guano can give rise to serious human disease problems. 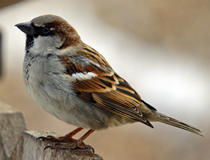 Few systems are effective, due to the birds small size and agility, with the exception of 28mm mesh netting. Other options are available if a net is not appropriate.